I ran across Skitch.com from the picture in my last post. 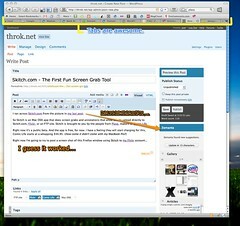 So Skitch is an Mac OSX app that does screen grabs and annotations that allow you to upload directly to Skitch.com, Flickr, or an FTP site. Skitch is brought to you by the people from Plasq, makers of Comic Life.